A Home away from home, this charming villa is nestled in the foothills of the famous Mont Ventoux in the heart of Provence. It lies at the end of an Impass within walking distance of the local village of Caromb. Its large open plan kitchen and lounge give light and space to all living areas, with intimate terraces and an enclosed pool and garden. A perfect base for cycling, with direct access to some of the best cycling routes in Provence. Your hosts, who live locally, specialize in creating an information package to help you become immediately familiar with the area and how everything works, from buying a car to health insurance. They have links to the local schools and can help to enrole your children into the primary school system for the school year (September to June) up to age 11. Please ask for more details. Wood for wood burner not included, pool closed October to April. My husband and I have been running "Provence Seasons" a villa rental business in Provence since 2003. We now have a wonderfully large, fully furnished, character villa available for monthly lettings between November and April. 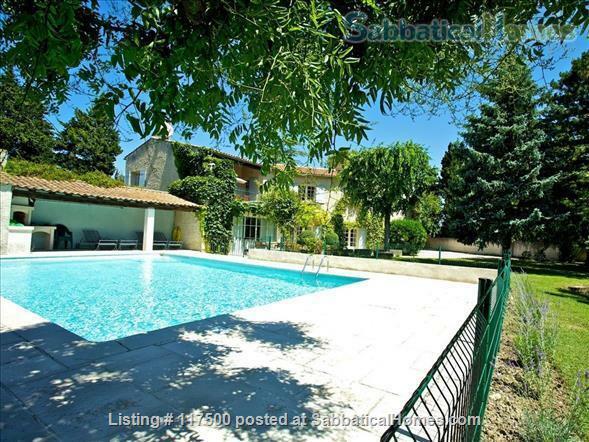 With its convenient position close to the University of Avignon, it is a welcome retreat, a home away from home, with a beautiful lawned garden, large pool and balcony terrace. We have not rented The Olive Garden through Sabbatical Homes before so please visit our website to see the reviews.